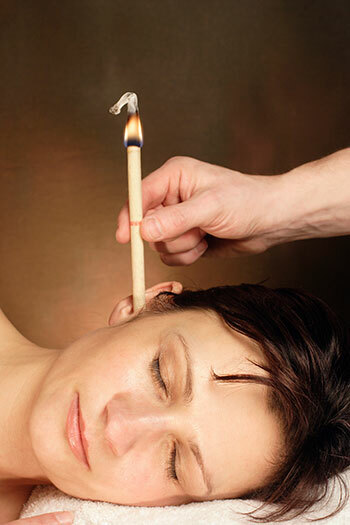 Ear Candling involves burning a cloth/wax hollow 'candle' in the ear for therapeutic effect. This procedure is generally rejected by the allopathic medical community as ineffective and in some cases dangerous, but if performed using well constructed 'candles' by an experienced practitioner, there is little risk involved. Ear candles are made from beeswax and unbleached cotton cloths and are impregnated with essential oils (e.g. camomile and sage). The candles typically burn for approximately ten minutes. We use Biosun Hopi Earcandles which have the CE mark and are a class IIa medical device in the EU. With an ear candle inserted into the ear, the heat from the flame creates a stimulating, soothing, warming effect. The therapeutic effects from this process are thought to be energetic in nature. The ear candle does not actually remove ear wax, but may soften it to allow the body to rid itself naturally. The effect of warm smoke in the ear canal may be of benefit to those suffering from an ear infection. You would remain fully clothed during the session. A short consultation is performed to check your medical history and note any ear conditions. An otoscope may be used to inspect your ear canal and 'ear drum'. During the session you would lie comfortably on your side on a treatment couch. A candle is gently inserted into the outer part of the ear and lit. There may be some light debris from the candle after burning, which will be wiped away. You would turn on to your other side as both ears are normally treated. After the candling, you may receive a gentle ear/face massage, working on the lymphatic drainage vessels around the sinuses and side of the neck. You may be advised to use Olive Oil drops in the ear(s) to help remove any softened wax (3 or 4 drops at room temperature, with gentle massage to the ear, repeated once or twice a day for up to a week). If you have a severe blockage (wax or any other obstruction) you may be referred to your doctor. Many people use Ear Candling for relaxation purposes. If you are in any doubt about these conditions or have an undiagnosed ear problem, please consult your GP before booking a session. To read about Ear Candling and Energetic Healing, read this article by Patrick Quanten.